GHA President Earl V. Rogers takes part in the installation of Emory's John Fox as the 2014 GHA chairman. 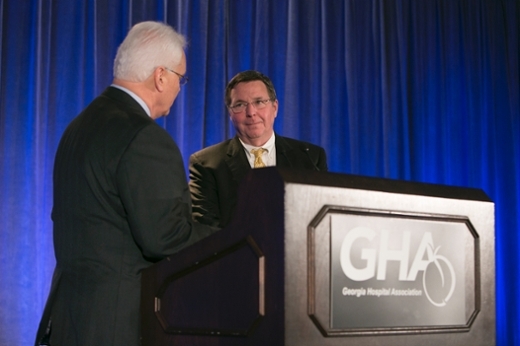 John T. Fox, president and CEO of Emory Healthcare, has been named chairman of the Board of Trustees for the Georgia Hospital Association (GHA). He was installed to the new post at the association’s annual convention on Friday, Nov. 14 in Atlanta. He succeeds 2013 Chair Cindy Turner, president and CEO of Bacon County Hospital and Health System in Alma. In 1999, Fox joined Emory Healthcare, Georgia’s largest and most comprehensive health care system with more than 16,000 employees. Emory Healthcare’s six hospitals and three physician groups are transforming health and healing with a focus on patient- and family-centered quality care. To help achieve exceptional clinical outcomes, patient safety and service, Fox and his Emory Healthcare leadership team have concentrated on expanding various elements of the system’s culture – elements centered on attributes that include a fair and just culture, transparency and cultural diversity. In 2014, University HealthSystem Consortium (UHC), a national organization comprised of most of the nation’s leading academic medical centers, ranked Emory University Hospital (combined with Emory University Orthopaedics & Spine Hospital) eighth nationally in the UHC Quality Leadership Awards. Under Fox’s leadership, this is the fourth consecutive year that Emory University Hospital has ranked in the top 10 for demonstrating superior performance in delivering high-quality care and safety excellence. Emory Healthcare is also the only health system in Georgia with two Magnet-designated hospitals, Emory Saint Joseph’s Hospital and Emory University Hospital, for nursing excellence. Prior to joining Emory Healthcare, Fox was executive vice president of Clarian Health in Indianapolis, and before that, vice president and CFO at the Johns Hopkins Hospital in Baltimore. As an MBA/CPA, Fox began his career at Coopers and Lybrand, working extensively in health care consulting. He earned a bachelor’s degree in economics and history from Washington University in St. Louis and has a master’s degree in finance. "John Fox has a proven outstanding ability to lead effectively during challenging times," said GHA President Earl V. Rogers. "He is a very well-respected health care leader and we are extremely pleased to have his experience and leadership on the GHA Board." Fox’s professional memberships include the American Health Plans Association, the American College of Healthcare Executives, the Council of Teaching Hospitals and Health Systems Board, the Health Care Systems Governing Council of the American Hospital Association, the Healthcare Institute, MedShare Board, the United Healthcare Executive Advisory Committee, the Atlanta Committee for Progress, the Metro Atlanta Chamber of Commerce and the Atlanta Rotary Club. He will serve as GHA chairman for one year, until Nov. 2015.